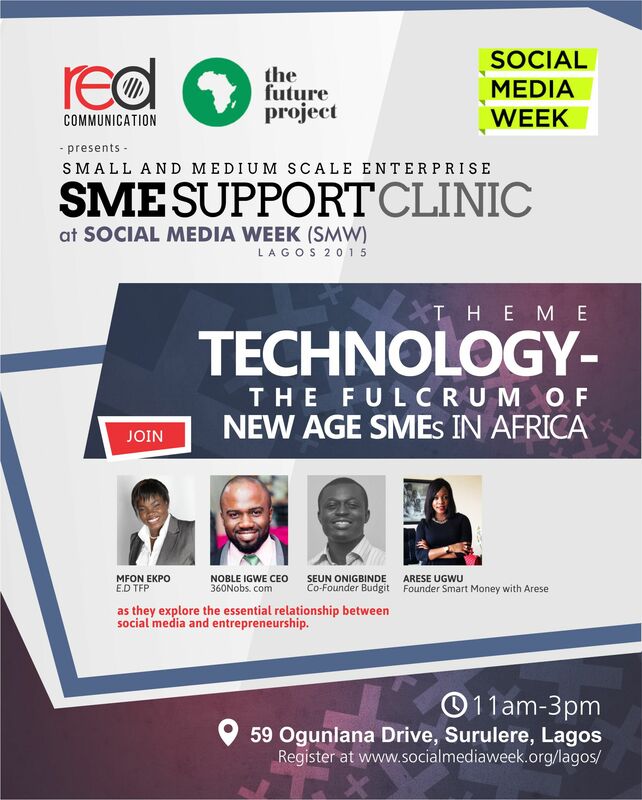 Red Media Africa (RMA) and The Future Project (TFP) are pleased to present the SME-Support Clinic, “Technology—The Fulcrum of New Age SMEs in Africa”, as part of Social Media Week 2015 in Lagos, Nigeria. Designed to educate owners of small businesses and budding entrepreneurs on positive impact of leveraging digital technology on business productivity, the SME Clinic is set to demonstrate visionary business solutions to pioneering entrepreneurs and small-medium enterprises, inspiring them to create the next generation of global brands. The selected speakers have been involved in social enterprise and innovation across the continent and they will be sharing their experiences and giving insights on how participants can find their own niche and enjoy success. 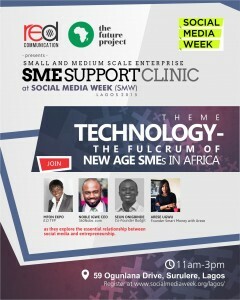 The speakers are: Noble Igwe, CEO 360Nobs.com; Seun Onigbinde, Co-Founder Budgit; Arese Ugwu. Founder Smart Money with Arese; and Mfon Ekpo, ED TFP and Oluwatobi Soyombo Head of Technology Red Media Africa. As part of TFP’s quest to contribute significantly to youth development in the rapidly evolving digital age, these speakers will explore the essential relationship between social media and entrepreneurship. The clinic is targeted at young Nigerians to broaden their knowledge and inspire new thought. Venue: Red Media Africa office, 59 Ogunlana Drive, Surulere, Lagos. The Future Project has a simple mandate – to build empowered citizens across Africa, through (inclusive) enterprise and (active) citizenship. This focus on Human Capital Development is informed by our value proposition: Africa’s growth needs a generation of young people who are gainfully employed and able to demand better leadership. Red Communication is a PR & Communication firm under the parent company, RED. An innovative media group focused on Africa, RED’s vision is to excite and empower an evolving generation through the media’s limitless possibilities. Built across tools and platforms, its Communication Division holds Red Communication, Red Marketing and Small & Medium, and StateCraft; and its Content Division holds the Y! brands, including Y! TV, Y! Radio, Y! Magazine, YNaija.com, Teen Y!, Y! 2015, the Y! Tech 100 and the Y! Annual Black Ball/Y! 100 Most Influential List. 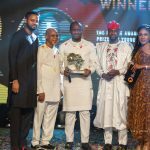 It also anchors a development firm, The Future Project, which co-presents Africa’s leading youth platform, The Future Awards Africa, and other projects including the Nigeria Symposium for Young & Emerging Leaders, 100,000 Jobs and #StartupsAfrica.